Steklarna Hrastnik Builds an 8.5 Tonne 3D Puzzle in the shape of the Pyramid out of 20,708 Puzzle Glass Bowls • BTC d.d. 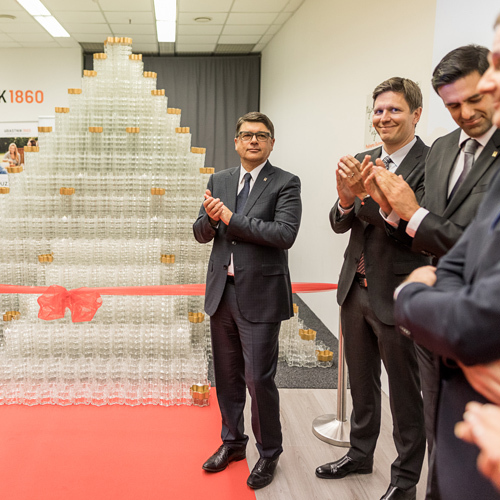 The quality of glass, the 3D modularity of the Puzzle bowls and the technical perfection of production for vertical and horizontal stacking – these are the factors that made it possible to carry out the idea of breaking the Guinness World Record. The project was a result of the collaboration between Steklarna Hrastnik and company BTC and PBC1860, the Steklarna Hrastnik club aimed at giving young people the opportunity to work on projects in order to obtain practical experience. “These types of innovative projects are made possible by the environment in Steklarna Hrastnik, where we support innovative thinking. My congratulations to the team who came up with this bold idea and carried it out,” said Andrej Božič, General Manager of Steklarna Hrastnik. The world’s highest 3D pyramid puzzle is further proof of the countless ways in which the Puzzle glass bowls can be used, taking users into a whole new world of creativity and experimenting. On top of that, the Puzzle bowls – the design is this year’s Red Dot Award winner – are made from some of the best glass in the world, which has a crystal shine and contains no heavy metals.